Pápai Páriz Ferenc, Album amicorum p. 439. Fac sapienter opus, Fer patienter onus. Avara Latinitatis manus, quatuor solummodo verba imperativi modi terminavit in consonantem, quibus tamen omnia singulorum fidelium officia elegantem in modum sunt expressa. Labore erudito, eruditione probo, probitate pio, pietate maxime conspicuo, et variis per exotica Regna peregrinationibus Cultissimo, Nobilissimo ac Eruditissimo Juveni Viro D[omi]no Francisco Páriz Papai, Medicinae Doctori Experientissimo, peregrinationis suae Anglicanae Promotori Liberalissimo, et quamdiu in hoc fragilitati obnoxio vitae tabernaculo hospitare licebit, jugi observantia prosequendo memoriam suam & se totum humilimè commendatur. Symb. Per aspera ad prospera. Tell your prayers without end, lead your life without sin, / do your things wisely, carry your burden with patience. The covetous hand of Latins closed the imperative of only four verbs with a consonant; but with these four all the duties of every believer can be expressed. In London, on the Idus of September of 1723. Motto: Through difficulties to felicity. 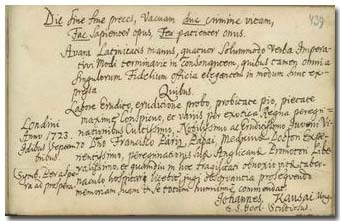 János Kausai wrote in the album of Pápai Páriz on September 13, 1723, indicating his being Hungarian and a student of theology (Ung., S. S. Theol. Studiosus). He immatriculated in the rolls of the university of Utrecht in 1724 as “Johannes Causai, Kecskemethino-Hungarus.” From this we learn him to come from Kecskemét. We have no more data about him.